Image of a typical VoIP phone which includes a digital display. While there are many benefits to using a VoIP system, there can also be drawbacks. For example, a dial tone on a VoIP phone does not guarantee the phone is working properly. One potential issue when using a VoIP system is that if the internet goes down, the phones lose the ability to make or receive calls until internet connectivity is restored. Once the phone is able to re-connect to the internet, it will automatically pull down its specific configuration and be usable within a few minutes. This process is carried out without any interaction by the end user or IT staff. Second, VoIP phones connect to RJ-45, or Ethernet ports, while traditional analog phones connect to RJ-11 ports. This means it is important to make sure there are enough Ethernet ports available which is normally only an issue with older buildings. NOTE: In the absence of a traditional port, a wireless bridge can be used to provide internet access to a VoIP phone if a wireless network is in place. Another important facet about VoIP phones is that having a dial tone does not automatically mean a phone is operational. The dial tone heard on traditional analog phones means the phone has successfully connected to a phone carrier's switch and a call can be made. Unlike traditional analog phones, the "dial tone" heard on a digital VoIP handset is actually a .wav audio file. As such, hearing this tone does not guarantee the phone is connected to the internet and can make calls. 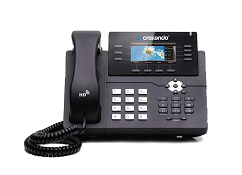 The best way to ensure a VoIP phone is working properly is by making a call to an outside number. If the call is successful, then the device is fully functional. If the call fails, try verifying the phone has been configured correctly in the web interface, and that the device truly is getting access to the network. While VoIP phones provide a vast array of features and require less upfront costs to implement, there are important things to know when implementing and maintaining a VoIP system. A VoIP system needs the right ports available, a reliable internet connection and has a false dial tone, making it important to understand how VoIP phones actually work. Luckily, many of these obstacles are easy to overcome and the benefits often far outweigh them. As always, knowing the benefits and drawbacks to any technology is key to a successful implementation and use!